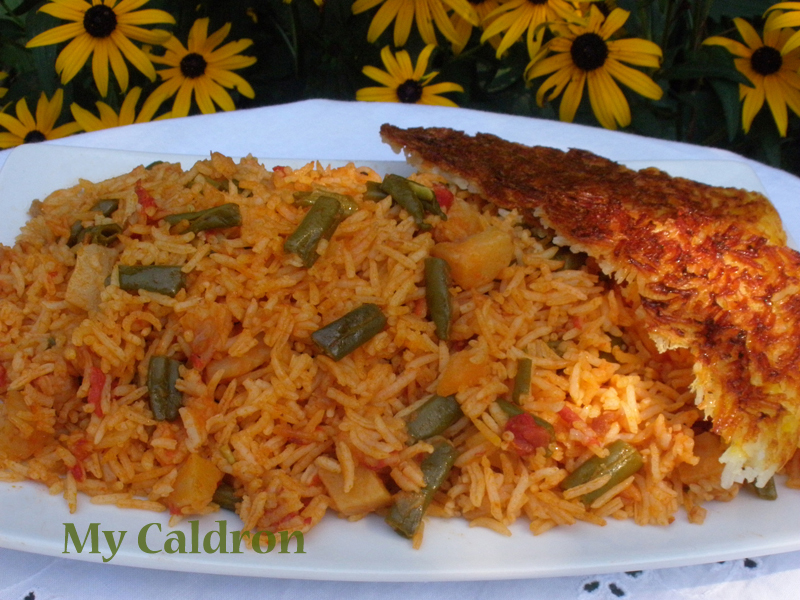 Loobia Polow is another of popular mixed rice, typically made with cut green beans and diced meat (often beat or lamb, and less frequently with chicken breast). Developing a dislike for meat family over the past years, I have been trying to skip or replace the meat component of Persian foods – with much success, I must boast! As for the dish at hand, I have replaced meat with potatoes which makes it quite similar to another Persian dish called estamboli polow. This version is much faster to prepare and just as delicious in my opinion. Please read through, as I will be explaining, for the first time in this blog, a simple method of preparing rice which is half way between two methods of preparing rice Iranian style: soaked & drained (saaf kardeh) and not drained (kateh). 1 teaspoon rice advied (advieh polowi) to be bought from Iranian stores. If not accessible, use ¼ teaspoon cinnamon instead. ½ cup yogurt (this is optional and goes with saffron to make special kind of rice tah-dig or the crunchy and golden part of the rice. Have your sources of salt, black pepper and oil handy as well. 1) Place 2 tbsp. oil in a medium pan over medium heat, add onions and sauté until transparent. Add turmeric and advieh and sauté a bit more and remove from the heat. 2) Place 2-3 tbsp. oil in a frying pan over medium high heat and sauté the cut beans. Stir frequently and stop frying when you get slightly soft and not to dark beans. 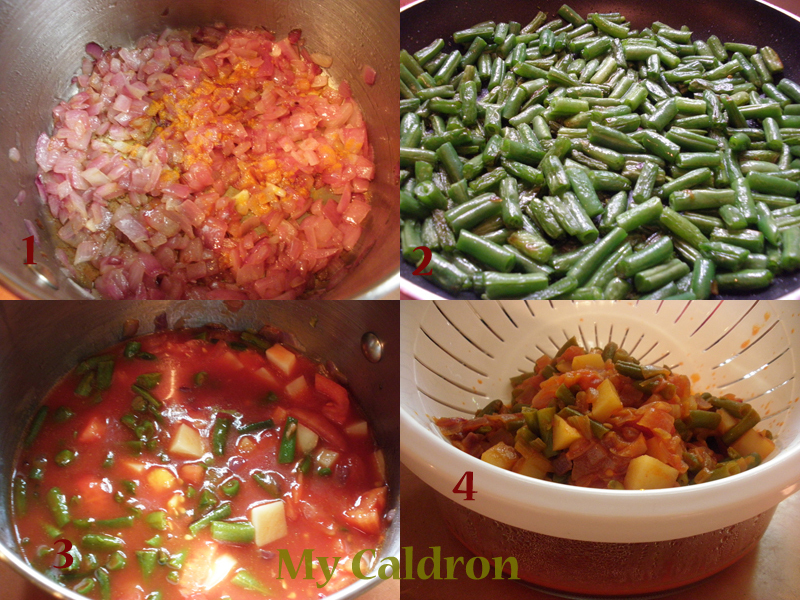 3) Add cut beans, cut potatoes, cut tomatoes, V8, plus some salt and pepper to the onions’ pot. Stir and cook over medium heat with closed lid for 30-45 minutes. Don’t worry if you don’t see much juice in the pot in the beginning; tomatoes will gradually produce some. At the end of this stage, you should have semi-cooked potatoes, and at least one cup of juice left in the pot. 4) Place a bowl under a colander. Pour the pot’s contents in the colander and let the vegetables’ juice drain. We need this juice to cook our rice with, so hold on to it for now. Extra: I have already explained how soaked and drained rice here, which is the first and more formal style of Persian rice-cooking. When rice is not soaked and drained, it is cooked in water, oil and salt until the water is fully absorbed, at which point the lid is covered with a cloth to be steam cooked. The second method, which is called kateh (when rice is plain) or dami (when rice is layered), is easier requires less preparation and is actually more practical on daily basis; however, it usually results in a softer and stickier, therefore less “presentable” rice. Most importantly, with kateh, your tah-dig is unlikely to turn crunchy and golden mainly because the rice will not be spread directly against the hot oil at the bottom of the pot.Now, I have a magic formula to make drained-looking kateh, with no soaking requirement and absolutely beautiful tah-dig. You could try this method for plain or mixed rice. 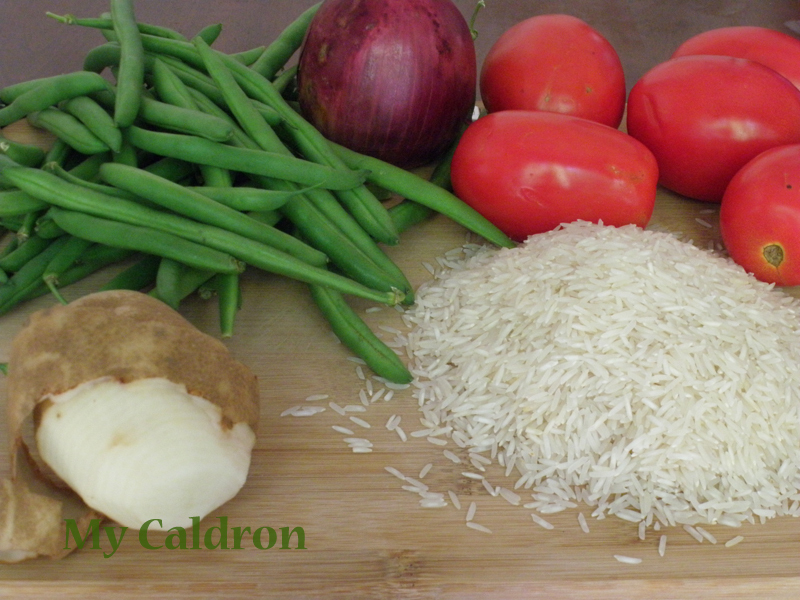 For tah-dig, you could go simple, with rice alone or if you prefer with flat bread or chopped potatoes. OR you could go a bit further and follow the yogurt mix recipe below for any type of plain or mix rice. Wash your rice in a pot thoroughly (let’s say three times) until water runs clear. You should use your fingers to rake the rice. Make sure you have no or very little starchy water in the pot at the end of the rinsing process. Had you had plain rice, you would have added three cups of fresh water over your three cups of basmati rice, in addition to a bit of salt and oil and took it from there. However, now we want to use the vegetable juice as well. So, measure the juice and add it on the top of the rice in the pot. Let’s say you added 1 cup of Veg. juice. Add 2 more cups of fresh water; plus, 1 tbsp. oil and ¼ tbsp. salt. Cover the pot with the lid and turn the heat to its highest setting. Once the water/rice is brought to a boil, place the lid in a semi-open position and turn the heat down to medium. Let all the water be absorbed and evaporated. Empty the rice in a bowl. Wash the excess starch from your pot, and put it back on the stove and let it dry completely. In a small bowl mix about half a cup of your rice, 8 tbsp. yogurt and a pinch of powdered saffron. Heat 2 tbsp. of oil in the pot and spread your rice/yogurt mix over it. Mound half the remaining rice back into the pot, then transfer the contents of your colander on the top of the rice and as the third and final layer, mound the rest of the rice and form the whole thing into a small pyramid. Make a few holes in the rice with spatula’s handle. Cover the lid and keep the temperature just before minimum until you notice steam is building inside the pot. Cover the lid with a clean towel and close tightly. Turn the heat to low and let it steam-cook for at least 45 minutes, but no longer than an hour. To serve, use a spatula to gently mix rice and beans –mixture, as you spoon them out into the serving platter. Tah-dig should come out easily enough and goes either in a separate plate or beside the rice. The dish is a whole and complete one as long it is served with small side-dishes, such as fresh herbs (sabzi), torshi (Persian pickles) and ideally Shirazi salad! If you don’t have V8 juice, there are a number of recipes around the web for making your own. Many homemade V8 recipes call for Worcestershire Sauce, which most people don’t realize is a fermented fish sauce made from anchovies.